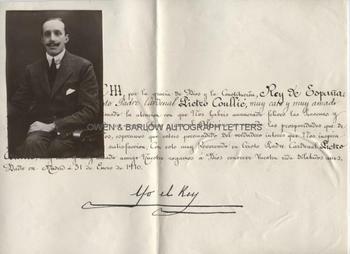 KING ALFONSO XIII Letter Signed. King of Spain from 1886 to 1931. Letter in clerical court hand, signed 'Yo el Rey' (I the King). Madrid. 31st January 1910. To Cardinal Pietro Coullie. Together with a contemporary real photograph post-card portrait. Text in Spanish but apparently a cordial message of good wishes on his retirement for a happy easter and an enjoyable rest and expressing the hope that the almighty grant him all the peace that he could wish for. Hoping that he will be convinced of the King's true interest that inspires him to be at his service and his very dear friend and praying to God for his long life, etc. Quarto. Approx 13 x 8.5 inches. Slightly trimmed at top edge. Slight mounting traces to verso, else fine. The portrait is a real photograph post-card, trimmed at edges and with mounting damage to verso. Alfonso XIII of the House of Bourbon and Habsburg-Lorraine was the son of Alfonso XII of Spain and Maria Christina of Austria. He was a monarch from his birth, his father having died before he was born and his mother served as Regent until he was 16. Alfonso XIII fled the country when the Second Spanish Republic was proclaimed in 1931, although he continued to claim the Spanish throne in exile until 1941, when he abdicated in favour of his son, Juan.